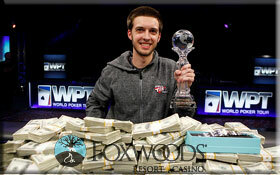 The final table of the World Poker Tour Foxwoods World Poker Open was a lesson in extremes: On the one hand you had poker superstars like Tom Marchese, Mohsin Charania, and Keven Stammen, and seated amongst these three poker millionaires were three virtually unknown players, Dave Inselberg, Nikolai Yakovenko, and Jeff Forrest. Forrest was the least experienced of the group –this was his first cash in a live tournament, in fact it was his first WPT tournament! But he was somehow able to weave his way through the remaining 5 players to claim the title, and pocket nearly $550,000 in the process! Marchese entered the day with a solid chip-lead, as well as having passed Dwyte Pilgrim on the Card Player Magazine Player of the Year leader-board; unfortunately Marchese’s final hand basically summed-up how his day went, where he found himself all-in with AK against the K6 of Jeff Forrest, only to see a 6 spike on the flop. Marchese finished the tournament in 3rd place –worth $211,759—and picked up 990 POY points, putting him about 750 points ahead of Dwyte Pilgrim. This entry was posted on Thursday, November 4th, 2010 at 6:00 am and is filed under Poker News. You can follow any responses to this entry through the RSS 2.0 feed. You can leave a response, or trackback from your own site.